Pictured are Harry O'Neill Chairman of DCNI, Dr Mike Johnston Chief Executive of DCNI, Minister Foster and Ms Wang Shuying Chinese Consulate General. Dairy industry leaders gathered at Stormont’s long gallery today to hear details of a major dairy export programme jointly funded by the Dairy Council for Northern Ireland and the EU. The Minister of Enterprise, Trade and Investment, Arlene Foster gave her support to the three year programme which will help dairy companies drive sales by identifying new customers in SE Asia, Middle East and Russia. The first event will be participation in SIAL China next month, which has over 2,700 international exhibitors, with DCNI joining with Northern Ireland processors Dale Farm, Fane Valley and Pritchitts to promote EU dairy products from Northern Ireland. The new dairy export programme is a three year €625,000 initiative. The DCNI export programme is the first of its kind across the UK’s agri-food sector to secure EU funding (50%) with DCNI contributing the remaining funding for the programme. The programme will include participation in SIAL, China (May 2015), and possibly ProdExpo Moscow (2016). 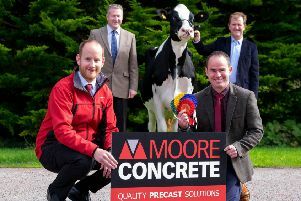 Each year the programme will bring to Northern Ireland 16 potential new buyers for three day visits. It will also bring three journalists per year to NI from the target regions of Russia, SE Asia, and Middle East. The programme will also have a dedicated web site, information brochure and a DVD.